I learned something new last week when I was at the Bird TLC clinic. But, that's not unusual for me. I usually learn something, mostly small things. I stick my nose in whenever I'm there and there's something new or different going on. I'm also not bashful about asking questions to make something more clear to me or just my plain ol' curiosity kicking in. (Heck, I'm usually not bashful about anything). All the staff and volunteers offer any information freely. 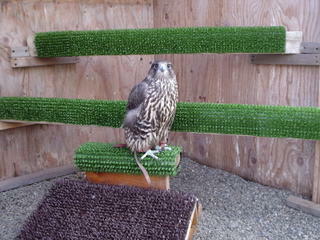 About a week and a half ago, Travis Boom brought in this gyrfalcon he named Phil. Travis is a doctorate student at the University of Alaska Fairbanks. He volunteers his summers at the Yukon Delta Wildlife Refuge as a biological technician. Phil has no flight or tail feathers. He would have died if not rescued by Travis. 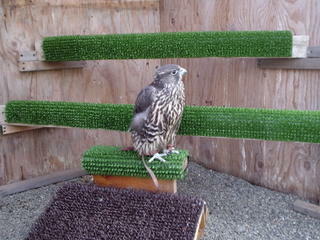 His intentions was to bring Phil into Bird TLC for rehabilitation or placement in its education program. There were a lot of people around when he brought Phil in the clinic and I didn't want to get in the way. So I just stayed back and figured I catch up later on. Copies were made of a newspaper article in The Delta Discovery about them. The article was posted on the rahab bulletin board. It was a little large so I decided to read it later on also. Things were slow one day later in the week and Rehab Director, Cindy Palmetier took me on a tour of all of her patients. We got to Phil and she told me that she really wanted him in an outside mew. The problem was Phil can't fly and all of the perches in the outside mews were too far off the ground for him. I'm not sure, but I think that's one of her ways of asking me if I would fix that. She knows I wouldn't say no. Heck, 2 1/2 years ago I volunteered to be the Bird TLC Webmaster. First thing I did was run to the book store and bought "Webmastering for Dummies". I was really busy the rest of the week, so I went into the clinic on Sunday. On the weekend is best for me, very few interruptions. I took out the old perches and replaced them with two new lower perches. The upper one is able to be relocated higher without much effort if needed. I did some other minor repairs to the mew, cleaned up my mess and went home. On Monday I went in to see what Cindy thought of my project. She said it was great, go out and look because Phil is in the mew. She said she still had to add a little ramp. I checked it out and Phil was comfortable, at least until I came close. I took a few pictures so I could maybe do a write-up in the blog later on about my craftiness and Phil. On the way out I grabbed a copy of the news article. Later that night when I had a chance, I read the news article about Travis and Phil. This is when my education began about gyrfalcon in Alaska. I didn't know that one of the highest concentration of gyrfalcon in the world is in the Yukon Delta. This species is considered a special concern for Alaska. This is the only state in the U.S. that has breeding gyrfalcon. That's where Travis Boom's work is important, checking out how the state's population of gyrfalcon are doing. So, a couple thanks go out here. The first one to Travis Boom and his field partner Josh Spice for rescuing Phil. Also, for the great work they do each summer. The second to Phil, for educating me on his species especially in the state of Alaska. Something that I was casually ignoring. As Travis said "I'd like the community to know that there is a phenomenal species of bird here. They are residents of Alaska and they are here year round." I know it now.